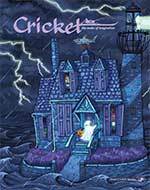 Enjoy tricky treats this Halloween with Cricket. It’s spooky when a vampire delivers pizza, the new kid is a werewolf, and your best friend is from space. Enjoy the spooky fun, along with the second part of our historical fiction serial about the Berlin Airlift, an article about the world’s scariest ride, and a new “Mystery” poetry contest.